The sleek Omega VSJ843R Series is the round versions of the VSJ843 line-up. In contrast, the Omega VSJ843Q Series is square or cube-shaped. It is available in a silver finish, the Omega VSJ843RS or in bold red, the Omega VSJ843RR. This vertical slow juicer operates at 43 RPM instead of the standard 80 RPM. It features an all-new twin-winged auger, which makes it twice as efficient during operation. The auger has been redesigned to work in conjunction with the Automatic Wiping System. This innovative design made it possible to remove the additional gear that has powered the AWS in previous models. Using silicone wiping blades, the AWS wipes away excess pulp from the juicing mesh to allow for continuous juicing. The auger has a tighter fit tolerance that squeezes more juice. The juicing screen has received a makeover and consists mainly of stainless steel mesh. The holes in the screen have been reduced in size, resulting in a less leftover pulp. The one-fifth HP condensed motor only uses 150 watts and 120 volts of power during operation. The Omega VSJ843RS and Omega VSJ843RR weighs 22 pounds but doesn’t have a handle. It takes up less space on the counter than the cube-shaped versions. If you have less space, this electric juicer is the better option. It will fit under the majority of kitchen cabinets. The auger and plastic components of the screen are comprised of GE Ultem plastic, which is eight times stronger and extremely durable. It is BPA-free. It comes with a convenient juice tap that gives you the option of mixing your juice or nut milk inside the bowl. One complaint customers have about centrifugal juicers is they sound like a plane taking off out of their kitchens. With this juicer, it operates quietly enough to run while the household sleeps. This juice extractor is easier to assemble because the bowl only needs to be set in place on the base. Line the lid up, once it locks, you can safely turn it on. Prior to juicing, cut fibrous and dense items into smaller portions. Cut celery into pieces shorter than an inch if you do not want the stringy fibers wrapping around the auger. Hard vegetables like carrots need to be cut into sizable pieces, making it easier for the auger to crush them. Chopped carrots and celery also aid in moving softer items efficiently through the juicer. This juicer self-feeds, meaning you rarely need to use the included pusher. If you’re going to use the pusher, firmly push down on the produce. Putting too many items in at once, then you risk jamming the juicer. If this happens, turn the machine off. Reverse the auger to back up the items in the bowl to remove the obstruction. For best results, drop the items down the feed chute at a consistent pace without rushing the machine. Thanks to the AWS, cleaning time is reduced. The silicone wiping blades wipe away most of the remaining pulp from the mesh holes. It practically cleans itself, making your job a snap! Close the juice tap, fill the bowl up with water and flip it on. Let it run for a few minutes and then drain the water into the sink. After the water finishes emptying into the sink, put the parts into a sink full of warm, soapy water. Use the brush to remove the remaining pulp out of the mesh screen. You can rinse the parts off and clean them later, but if you let pulp dry in the juicing screen, it will be hard to remove. The underside of the auger needs to be rinsed as well. It will collect pulp underneath it, but it easily rinses away. Once everything is rinsed clean, set everything out to dry before putting the juicer back together. This juicing machine extracts juice slowly at 43 RPM. This method preserves the nutrients and vitamins in the juice. The juice maker produces a large quantity of full-flavored juice. All extracted juice results in some pulp. You have a few options if you would like to remove the remaining pulp. Pour it through a sieve or back through the juicer. You can also close the juice tap and let the AWS clear out the remaining pulp that catches in the juicing screen. If you do not have a sieve, don’t worry; the juicing screen is an excellent replacement. Drink your juice right away or store it for up to 72 hours in the refrigerator. Create delicious batches and store them in an airtight container with a tight lid. You can use glass, stainless steel or BPA-free plastic to store your juice. As long as the juice is kept cold, it will stay fresh. What Kinds of Produce Can the Omega VSJ843R Series Juice? Hard produce includes cilantro, yakon, celery, cauliflower, pineapple, pear, ginger, pumpkin, garlic, beets, watermelon, bitter gourd, sweet potato, fennel, pepper, asparagus, apple, coconut, carrots, turmeric, cucumber, and broccoli. You can turn soft fruits such as grapes, avocado, strawberry, kiwifruit, tomato, melon, mango, papaya, cranberries, peach, blackberry, and pomegranate into a puree using this machine. Leafy greens include pine tree needles, parsley, lettuce, beet greens, collard greens, wheatgrass, peppermint, spring onion, spinach, moringa, dandelion greens, cabbage, brussels sprout, kale, and basil. Citrus fruits include lemon, tangerine, mandarin, grapefruit, orange, and lime. 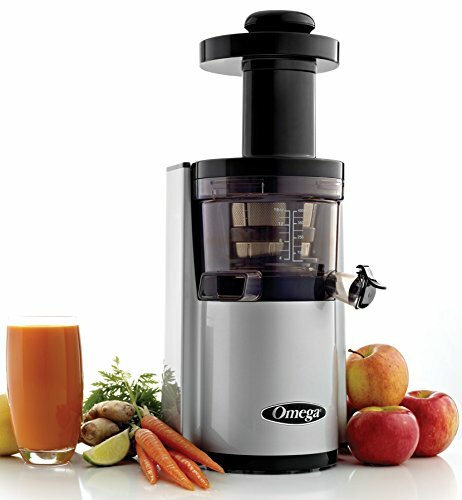 The Omega VSJ843RS and Omega VSJ843RR rotate at a lower speed of 43 RPM, which is almost half the speed of Omega’s previous upright masticating juicers. The low speed reduces the generation of heat and foam, creating higher quality juice. The new dual-edged auger does twice the work as a single-edged auger. The new auger innovation allows it to drive the Automatic Wiping System, eliminating the necessity of the extra gear unit. Some clients complain about the pulp collecting under the auger, but it takes seconds to remove and rinse the pulp out of the space under the auger. The On/Off switch is located on the back of this model. In the VSJ843Q series, the On/Off switch is in the front. This juicing machine is extremely versatile. Get creative and make baby food, sorbets, assorted fruit and vegetable juices, nut milk, and green juices. Juicing never has to be boring because the possible recipe variations are practically endless. An enjoyable feature for many customers is the juice tap that allows you to mix everything inside of the juicing bowl. It also keeps the counter clean. If you already juice on a daily basis, then you know this is an investment in your health and the juicer will end up paying for itself after a few months. Omega is a reputable company that has been around for a long time. Plus, the cold press juicer is covered by an amazing 15-year warranty. The warranty doesn’t just cover the motor. It also covers the parts. How many other companies can say the same thing? Whether you’re in the market for an upgrade or as a first-time buyer, the Omega VSJ843R Series is an excellent heavy-duty juicer for the person dedicated to a healthy lifestyle.